Here’s a heads-up regarding two upcoming webinars sponsored by CPA Leadership Institute and presented by Gary Adamson of Adamson Advisory. These two topics are usually at the top of the list of partner issues. I will discuss the most common compensation systems in use today and provide my perspective as a former managing partner of a top 200 firm. I will help you determine what is right for your firm and how a firm evolves from one system to the next as it grows. I will also give you some tips on setting up a performance-based system in your firm and how to align your compensation system to your firm’s strategic plan. Your accounting firm has several partners in their late 50s or early 60s. You don’t have enough young partners or future partners to take the firm into the future and still pay-out a significant amount of retirement dollars. What do you do? The popular choice is to seek a larger firm to acquire your firm. In a recent article for Accounting Today, Terry Putney and Joel Sinkin have shared ways to make your firm more attractive to acquirers. It used to be a seller’s market but it has now become a buyer’s market because so many smaller firms are looking for succession assistance. A large firm is “looking at” your firm and another firm of similar size. The other firm has embraced technology and you are still not completely paperless. They choose the other firm and leave you standing at the altar. Here are the Five Ways to Beautify Your Firm For M&A. Follow the link to read helpful descriptions about each of the five ways. Thanks to Terry and Joel of Transition Advisors for this helpful information. Recently, Marc Rosenberg contributed an article to CPA Practice Advisor titled 7 Must-Haves for Accounting Firm Succession Plans. Rosenberg notes that 80% of first-generation firms never make it to the second generation because they have non-existent or ineffective succession plans. If you want your firm to survive into the future, choosing the right partners is an important step. Often, owners make someone a partner without them truly understanding the expectations and responsibilities of a partner. Firms also often make someone a partner just because they don’t want them to leave the firm. In his article, Rosenberg kindly shares his one-page list of criteria for promotion to partner. You can download it here. Be sure to read his entire article. Thanks for sharing, Marc. At the BDO Alliance conference, the Succession Planning panel was comprised of Marc Rosenberg, Jay Nisberg, Carl George and Bob Lewis. It’s important for you to keep tabs on current trends in the succession area and tweak your own plan as the years go by. Daniel Hood, Editor of Accounting Today tweeted some great comments from the panel. I have selected a few for your contemplation. Nisberg: Too many Baby Boomers don’t see the people coming up behind them as having the same strengths they have. I assure you, they do – you just have to trust. Rosenberg: Partners need to have a show-down meeting: When do they want to retire? What do they want from it? It’s a hugely emotional issue. Nisberg: Vision is critical – highly successful firms have a vision that is the culmination of the will of the partners – where they want to go and how they want to get there. Rosenberg: 80% of 1st generation CPA firms don’t make it to the second generation. George: If you don’t put succession planning in partner goals and the compensation system, you will be stuck in the mud. Lewis: It’s important that staff know there’s a succession in place. George: A surprising number of firm leaders don’t understand the business of public accounting. Lewis: In many firms, staff doesn’t understand firm revenue, the actual size of the firm. How can they operate in the dark? George: Start teaching staff the business of public accounting on Day 1 – while you’re onboarding. Rosenberg: Get everyone in the firm to understand how the firm works and how it makes money. That needs to happen at CPA firms. Partners are much too secretive. Rosenberg: Staff doesn’t have a clue how much partners make – give them an idea because it’ll be higher than they expect. Lewis: If a non-equity partner isn’t willing to convert to equity, then you don’t really have a partner. Nisberg: I don’t understand why so many firms rush to M&A when there are so many other options. George: I’m very happy to see more women than ever running firms — and they’re doing a great job. 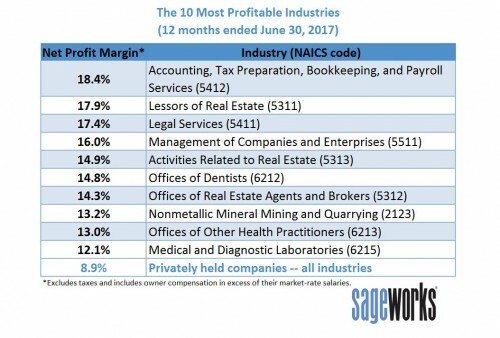 It’s no surprise to CPA firm owners, but accounting and bookkeeping firms (along with real estate leasing companies and legal services) top the list of the most profitable industries over the last 12 months. 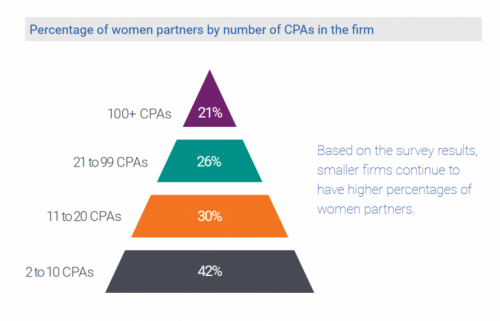 It’s nothing new, accounting has been at the top for several years, but I think sometimes CPA firm owners don’t think much about it, probably because they are used to the profit margins. The information comes from Sageworks in its annual ranking of the most profitable industries in the U.S. Most CPAs truly love the work they do. Sure, it involves some long hours, commitment and dedication to client service but being extremely profitable sure is a nice reward. Share this information inside your firm. Perhaps it will inspire talented, young CPAs to go down the future partner track. Some partners don’t want to share this information because the staff will want bigger salaries. Maybe it is time to have that conversation inside your firm. Many accounting firm owners/shareholders, in years gone by believed they were doing the right things. We can get by with two monitors, no one needs three. We need to stick with our professional dress code, our clients care. Not everyone needs access to remote connectivity. We don’t need to send more than one person to that management conference, they can come back and inform us all about what they learned. We can just send one person to that leadership training, they can teach it at the firm. It will be okay if we delay working on that succession plan until next year. We don’t need to spend very much on Christmas gifts for the staff, they really don’t appreciate it anyway. It is too hard to keep track of everyone’s birthdays, we don’t need to send a card to each person’s home. It will hurt production if we close the office on Fridays in the summer. Many partners called all of these things and other nice, little things they were expected to do for staff, “warm & fuzzy” stuff. In the past, some of these did apply but they sure don’t now. Never be afraid to admit that you were wrong and make important changes that will guide your firm into the future. In case you haven’t noticed, there is a lot of M&A activity going on in public accounting. There are varying reasons but one of the most prominent is the fact that current firm owners have not groomed, trained or mentored people to take over the firm. So, what do you do? You sell-out so you get “something” out of the practice that you have been a part of for 30 years or more. If you are a managing partner or sole-practitioner and are still several years away from that decision, you are responsible. You are in charge. The future of the firm is in your hands. You are responsible. It is your responsibility to communicate what is okay and what’s not okay. You are enabling behaviors to continue when they think what they are doing is okay. Begin planning to have those crucial conversations and maybe you can change your firm future. We are made wise not by the recollection of our past, but by the responsibility of our future.